When you first become the parent of a wonderful dog, you will have many different aspects of his care to consider. After immediate concerns such as where he is going to sleep and what he is going to eat, you should next turn your attention to his medical care, and in particular, his preventative healthcare. What is pet preventative healthcare? Preventative healthcare for pets refers to both testing and the administration of certain medications and treatments that are designed to prolong the health and wellbeing of a domestic animal. Veterinarians agree that comprehensive preventative care can significantly lengthen the lifespan of your dog. It can also help protect him from the unpleasantness of various diseases, and you from expensive veterinary bills. Vaccinations form an essential part of preventative healthcare for pets and are usually administered on a strict schedule. This is because each vaccine is only effective for a certain amount of time before the success of it begins to fade. By sticking to the prescribed schedule, the vaccine can be re-administered before it loses effectiveness completely. This should mean that your dog is never left vulnerable to the infectious disease that the vaccine protects him from. Your veterinarian will work with you to create a personalized vaccination schedule that is created specifically for your dog and based on his individual needs. It is essential that you adhere strictly to this plan, as failing to do so could leave your canine companion vulnerable to disease. It is important to understand that puppies have a very different vaccination schedule to an adult dog. This is because it is not safe to give such a small creature full doses of the vaccine. Therefore, smaller doses are administered more often until full protection is achieved. How effective is vaccinating your dog? Some studies suggest that no vaccine produces protection in 100% of the subjects that it is administered to. 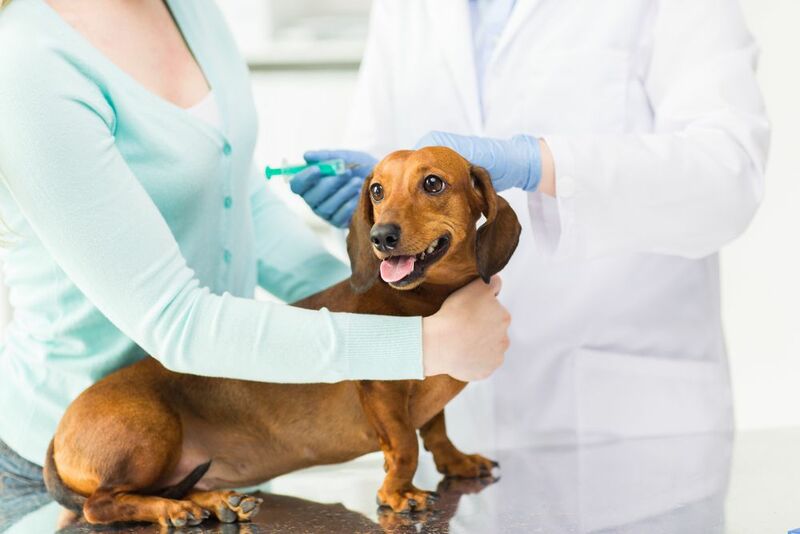 However, the vast majority of veterinarians firmly advocate comprehensive vaccination programs as the best way to protect your canine companion from the many serious, infectious diseases that threaten his health and wellbeing. However, it is not only your individual pet that vaccinations are helping to protect. Since many infectious diseases are highly contagious, in the past these illnesses could wipe out entire populations of animals. Fortunately, today, more owners than ever are vaccinating their pets, and the larger the number of pets being vaccinated, the less likely the diseases are to spread among the population and reach epidemic proportions. If you would like more information on dog vaccination schedules, or if you are concerned that your dog is not up to date with his vaccinations and you would like to make an appointment to discuss his medical care, our dedicated team would be happy to assist you. Please don’t hesitate to contact our clinic at your convenience.